Elite Email marketing service is an excellent platform to jump start any email marketing campaign. Fully featured and with hundreds of templates, Elite Email offers a professional service at a reasonable price. Let Elite Email guide you in to the email marketing world! The site’s homepage looks simple and non-sophisticated. But inside, there’s an impressive variety of professional templates and top-notch features on offer at competitive prices. Whether you are a newbie or a fully fledged email marketing veteran, Elite Email is a useful platform to work from. Take a closer look at what Elite Email has to offer. Inviting, attractive and professional looking templates are critical if you want to engage readers and entice them to sign-up! This is where Elite Email steps in, with a fantastic display of professional and polished looking templates, fit for success! Template Selection – Elite Email offers over 400 fully customizable templates in a variety of categories. The templates are accessible from the main dashboard and cater to a host of different industries with an abundance of choices on offer. 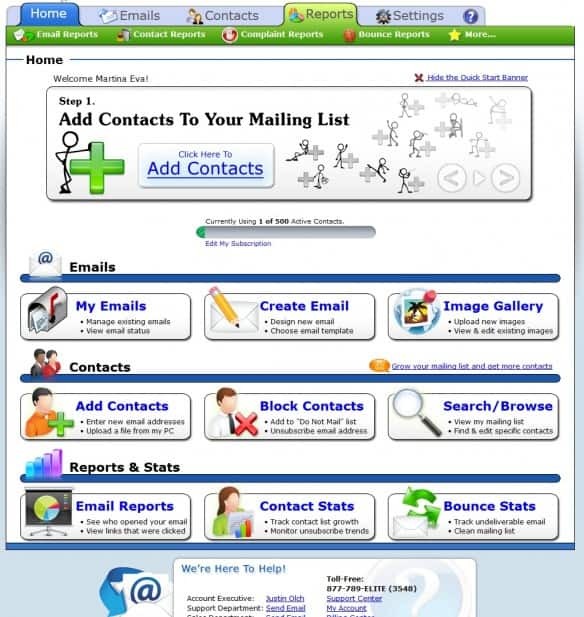 There are also dozens of completely customizable email signup forms to choose from. You can add a signup form to your website, blog or social media media, customize it to match your brand identity and instantly start capturing emails. Customization – Elite Email dropped the ball a little bit in this field. We weren’t as impressed with their customization tools in the template editor. The editor offers the essentials from changing background colors, easy image up-loader, editing font type and size, and moving content boxes around. You need to change text from the tools outside and not inside the template. So get ready to remember the name of each content box, so you don’t make confusing mistakes! Overall, it is easy to understand and quite intuitive. Multimedia – The majority of templates include high resolution images. They also offer thousands of free stock photos to upload. Plus, there is free media storage space for you to upload and store your own images. Within a few minutes, you can create a customized signup form on Elite Email to allow visitors to signup. Your automatic confirmation and welcome emails will ensure that your mailing list is always up-to-date. Elite Email has created a stellar template builder and site navigation for their customers. Templates are fully customizable, and creating a professional looking email message is very easy with the drag-and-drop editor. It is easy to add images, coupons, links and adjust color schemes in a few clicks! All templates are mobile friendly. The Elite Email system automatically adapts your content to fit on any PC, smartphone or tablet. Elite Email have certainly mastered the sending part, and allow you to easily syndicate your emails through the creator interface. Elite Email provide their customers with elite customer support. They have the live chat featured on every page, their phone number on video tutorials, as well as an email address for a specific person in the account management department. We were pleased to know there’s a live person at the other side and not some automated response mechanism. They have a robust FAQ section, a blog and a dictionary, providing even deeper explanations for specific email marketing terms. Two thumbs up for Elite Email in terms of support! Sign up for free and send unlimited emails each month, indefinitely, to a list of up to 500 subscribers! This is an excellent deal! Pay as you go – based on your number of subscribers and an estimate of your monthly outgoing emails, the package operates on a pre-paid credit basis and charges accordingly. Pre-paid credits are valid for one year. 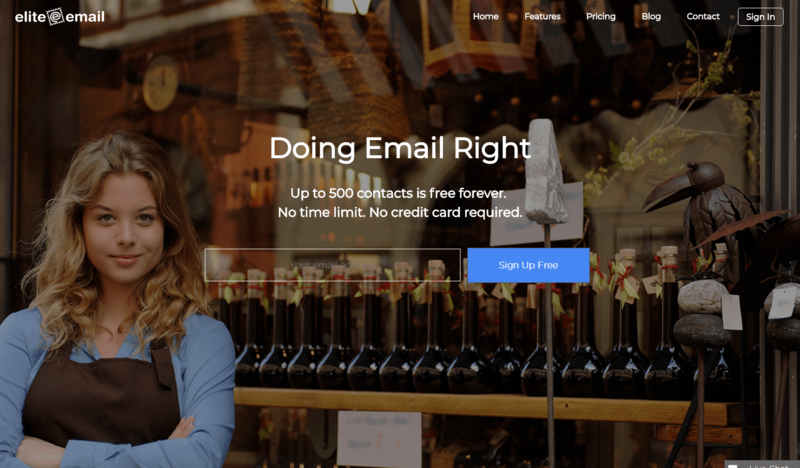 Monthly – Send unlimited emails per month and pay according to on your list size. Save 10% when subscribing for 6 months, or 15% when subscribing for one year. Yearly – based on list size, save 15%. Elite Email does have additional addons. If you want to remove their logo from your emails, you need to make a one time payment of $249. Elite Email’s outstanding template selection and builder, plus it’s free lifetime plan, make it a one of a kind email marketing service. Loyal to its name, this elite service is backed by experienced support teams, offering a unique user experience, with an intuitive platform from which you can easily launch any email marketing campaign. Try Elite Email free for a few days or a lifetime and let us know if you think there is anything we missed in this review. Share your thoughts with us on Facebook, Twitter or in an email.